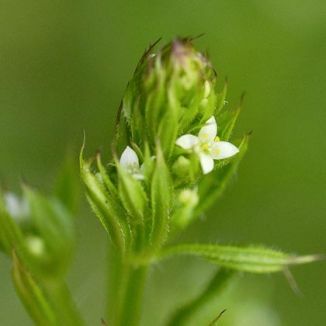 An annual plant of hedges, thickets, waste ground and gardens, Cleavers produces tiny white 4-petalled flowers (2mm across) in clusters on stalks arising from the leaf axils from May to September. This is a vigorous plant with square-stemmed, angular stems which have down-turned prickles which enable the plant to catch on to vegetation over which it scrambles. The pale green, oblong leaves are arranged in whorls of 5-9 around the stems and also have bristles which point backward. The fruit is a small sphere, also covered in hooked bristles. This is a native plant and it belongs to the family Rubiaceae. My first record of this plant is in Laragh, Co Wicklow in 1976 and I photographed it in Wellingtonbridge, Co Wexford in 2006. Without a doubt, the method by which this wildflower sows its seeds deserves a medal. At first sight it looks like a straggly, scrambling little plant, however when you get more familiar with it, in your garden for instance, your esteem for its cleverness is tempered with frustration as no matter how hard you might try to eradicate it, it will not go away. 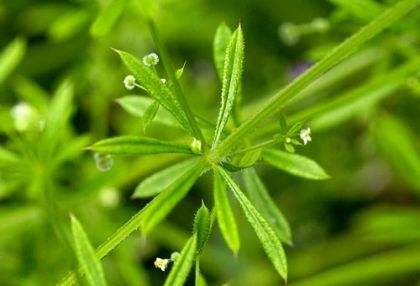 Cleavers was so-named for its ability to 'cleave' or adhere to anything it came in contact with, be it animal's fur or wool clothing, which ensured its seed dispersal and the future of the species. Also known as Robin-run-the Hedge and Goosegrass (much beloved by young geese), in my childhood it was known as 'Stickleback'. Herbal remedies for burns and wounds often contain Cleavers for its antiseptic effect.